Who Would You Put On Your All-Time Greatest NBA Roster? 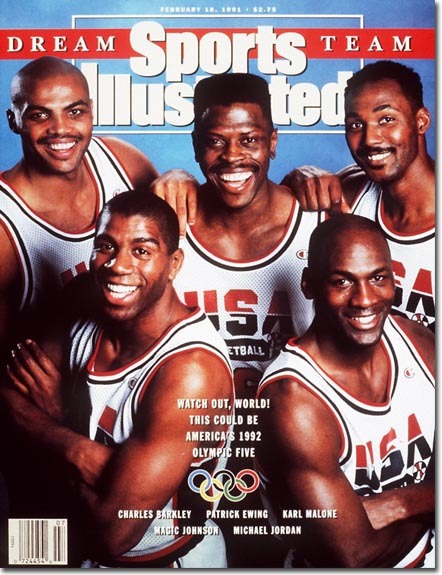 Though it seems hard to believe, it has been well over twenty-two years since the 1992 U.S. Olympic basketball team known as "The Dream Team" first played together. Comprised of professional basketball players from the U.S. for the first time and loaded with future Hall of Famers, the Dream Team trounced each of their opponents while easily winning the gold medal. With an NBAtv documentary and a book by Jack McCallum telling the story of the '92 squad, there has been much debate about whether another team could ever be assembled that could surpass the '92 U.S. Olympic basketball team. If I had to go with a starting five, I'd pick Magic at the point, Jordan at shooting guard, Dr. J at small forward, Tim Duncan at power forward and Kareem as my center. Between the five of them, there are a total of 20 MVP awards and 25 titles. That would be a tough starting five to beat. So those are my picks. Who would you place on your greatest team?